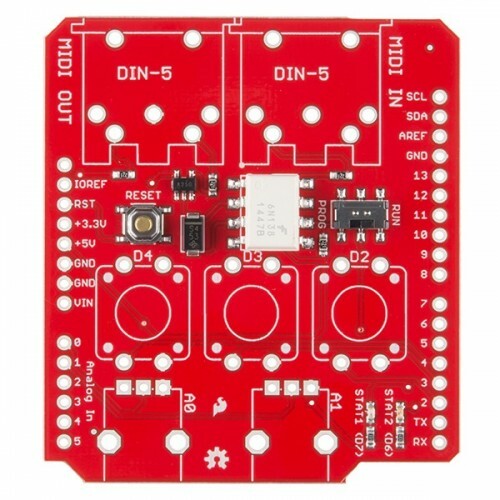 The Arduino MIDI Shield board from Sparkfun gives your Arduino access to the powerful MIDI communication protocol, so you can control synthesizers, sequencers, and other musical devices. The MIDI protocol shares many similarities with standard asynchronous serial interfaces, so you can use the UART pins of your Arduino to send and receive MIDI's event messages. 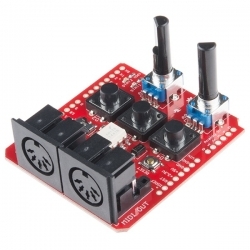 The SparkFun MIDI Shield provides an opto-isolated MIDI-IN port as well as a MIDI-OUT port. 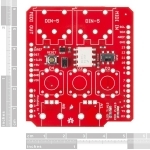 The MIDI Shield can be mounted directly on top of an Arduino, connecting the MIDI-IN to the Arduino’s hardware RX pin and the MIDI-OUT to TX. Potentiometers are connected to analog pins 1 and 2, and can be used to control volume, pitch, tone or anything else you’d like. The shield also comes with three momentary push buttons, a reset button, and green and red stat LEDs. The RUN/PROG switch allows you to program the Arduino over serial without having to remove the shield. This revision of the SparkFun MIDI Shield also adds several configurable features, such as converting the MIDI output to a MIDI thru, and the option to use a software serial port for MIDI, leaving the hardware serial for programming and debugging. It also buffers the output, making it compatible with the Arduino Pro without needing to circumvent the protection resistors on the serial TX and RX lines. 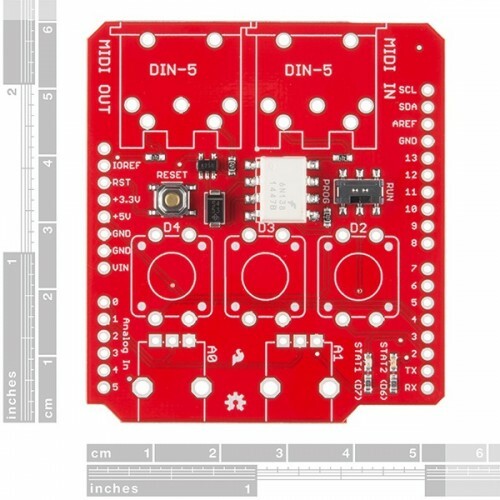 Note: The Arduino MIDI Shield does not come with the through-hole MIDI connectors or trimpots soldered on. 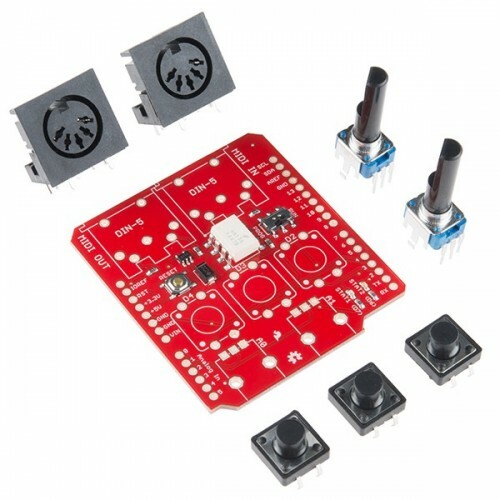 All of these components (2 MIDI connectors and 2 trimpots) are included with the product, however.